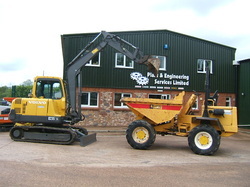 Is one of the largest spare parts providers for the construction industry in the United Kingdom. Specialising in dumper parts, £450,000 worth of Thwaites, Terex, Benford, Barford, JCB Dumper and Ausa parts are kept on the shelf for next day delivery, both nationally and internationally, ensuring that your everyday wear parts are available to keep your machine on site and working. Filters, centre pivot kits, hydraulic rams, cables, gearboxes and engines to name but a few are all readily available from stock. With 30 years of experience, part numbers are not required and our skill and expertise ensures the correct part is delivered on time, before 10.30 next day if required. As the largest Yanmar dealer in the U.K we are able to offer spare parts, new engines and rebuild facilities from our base in Exeter. With a stock of over 100 engines, Yanmar, Isuzu, Kubota and Perkins engines are available meaning that if your engine is beyond economical repair we can provide a quick and effective solution for you. Newage, ITL, Dana Spicer axles and gearboxes, Spicer and ITL transmissions and dropboxes, Danfoss units and hydraulic valves are available through our service exchange programme offering considerable savings on new units.